This used to be a well-known, very easy to grow/neglect houseplant in the UK, but I see it less often now. It is useful to rub the sap from a broken leaf onto cuts and burns. Because Aloe Vera plants are very succulent and consist of 95% water, they are extremely frost tender. If they are grown outdoors in warm climates, they should be planted in full sun, or light shade. The soil should be moderately fertile, and fast draining. Established plants will survive a drought quite well, but for the benefit of the plant, water should be provided. place it near a window that gets a lot of sun. You can move the pot outdoors during the summer months. Aloe Vera is a succulent, and as such, stores a large quantity of water within its leaves and root system. During the winter months, the plant will become somewhat dormant, and utilize very little moisture. During this period watering should be minimal. Allow the soil to become completely dry before giving the plant a cup or two of water. During the summer months, the soil should be completely soaked, but then be allowed to dry again before re-watering. 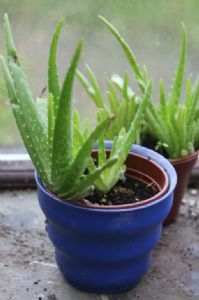 Aloes have a shallow, spreading root system so when it is time to repot choose a wide planter, rather than a deep one. Use a planter with a drainage hole, or provide a 1-2 inch layer of gravel in the bottom of the pot to ensure adequate drainage. Use a good commercial potting mix with extra perlite, granite grit, or coarse sand added. You may also use a packaged 'cacti mix' soil. Fertilize yearly, in the spring with half strength, high potash fertilizer (10-40-10). Aloe Vera plants are propagated by removing the offsets which are produced around the base of mature plants, when they are a couple inches tall (or larger). The medicinal properties of Aloe vera have been known and recorded since biblical times. It has been used for a variety of ailments, and as an ointment for burns, cuts, and rashes, as well as an ingredient in various beauty preparations. The sap of the Aloe is a thick, mucilaginous gel. It is this gel which is used medicinally. The outer skin has essentially no value, but because it is commercially easier and less expensive to utilize the entire leaf, 'whole leaf' Aloe juice has been hyped as the 'best'. This is not the case. As to the claims of the medicinal properties of the Aloe plant, I can only speak from my personal experience. I have kept an Aloe plant around for years, primarily for burns. In case of burns, an immediate application of fresh gel has relieved much of the pain, and prevented blistering for me, many times. I also found it to be quite effective to relieve itching from stings, bites and various 'stinging' plants, such as poison ivy. Aloe gel is also good for the same problems when they are encountered by your pets. When you need to use it medicinally, just remove a lower leaf from the plant, slice it open, and apply the gel on the affected area.